It's been a big year for Volkswagen with the introduction of the all-new Atlas and then the reveal of the updated Tiguan. The Atlas was designed for the modern American family making it a great choice for families needing an SUV but the Tiguan too offers great qualities for families as well as other customers looking for an SUV. Take a look at our 2018 Volkswagen Atlas vs 2018 Volkswagen Tiguan comparison to see the differences between the two and to get a better idea of what one is the right choice for you. 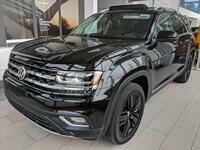 The Volkswagen Atlas was the automaker's first three-row crossover SUV but VW surprised us all by adding the option for Tiguan customers to choose an optional third-row to expand its seating capacity to seven. The Tiguan is smaller in size when compared to the Atlas so customers that really need the three-rows of seating will find that Atlas's interior more spacious and comfortable for passengers. The all-new Atlas offers two engine options for customers a 2.0-liter turbocharged engine which is the standard engine for the Tiguan, and a 3.6-liter V6 engine. The V6 engine is the perfect option for drivers wanting more power and capability. Both crossovers offer Volkswagen's 4Motion all-wheel drive system as well. The Atlas offers more in terms of towing power than the Tiguan. While the Atlas can tow up to 5,000 pounds the Tiguan is able to tow up to 2,200 pounds. While the Tiguan can now accommodate up to seven passengers, the Atlas was actually created to be a family-friendly three-row crossover. The Tiguan offers great qualities for families as well making it a great choice for families that may need less seating and towing capability. When it comes down to what VW crossover is the best choice, it will also come down to your needs and preferences. Both crossovers offer great qualities so be sure to check out our website for more information on the Atlas and Tiguan. Contact us today at Hall Volkswagen to talk to a team member about reserving a model.